Since 1923, when Coco Chanel arrived home from the Cannes tanned and glowing, the societal cosmetic craze for a golden skin tone has continued to gain popularity. Even before DHA (a chemical derived from sugar cane used as a main ingredient in tanning products to produce the “browning effect”) was approved by the Food and Drug Administration as a safe cosmetic ingredient, men and women alike used up every idea they could to mimic Coco’s golden, fresh-out-of-the-tropics glow, such as olive oil, tea bags, and even meat extract! Although these tanning trends have fallen wayside over the decades as a result of ineffectiveness or inconvenience, many people still go to great lengths to achieve a great tan. One such extreme that has acquire some recent attention involves beta carotene intake. People are asking whether or not eating more foods with beta carotene, or taking beta carotene supplements, will make them tan. But before you go down a large bundle of carrots or start adding supplements to your diet, there are some facts you need to know. 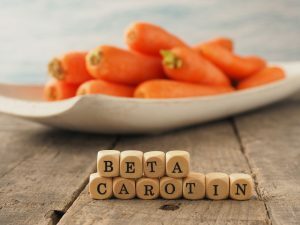 Beta carotene is a carotenoid, which the body converts into vitamin A. Carotenoids are any of a class of primarily yellow, orange, or red fat-soluble pigments produced by plants, algae, fungi, or bacteria. Basically, carotenoids give plants, fruits, and vegetables (even egg yolks) their color. Beta carotene is found in carrots, as well as, other colored vegetables, like asparagus, apricots, broccoli, grapefruit, peppers, plums, peas, spinach, onions, squash, sweet potatoes, and even ketchup. Because beta carotene produces color and pigmentation in the skin of fruits and vegetables, it has long-time been believed that consuming large amounts of foods containing beta carotene can make our skin tan. As a result, there have been fads, like drinking high volumes of carrot juice, to achieve a fake tan. And although there are no known harmful effects of consuming large quantities of carotenoids, there are some unpleasant side effects. One such side effect is known as Carotenoderma, which is when the skin turns yellow-orange. This skin condition doesn’t just discolor the skin that generally tans in the sun, it also turns the palms of hands and feet orange! This is not the tanning result you want, making excessive beta carotene intake ineffective for achieving a quality tan. Instead, there are plenty of foods that contain ample quantities of antioxidants, which helps your skin rejuvenate, thus tan better. These include Vitamin C, grape extract, green tea, beta glucan, and kelp. Beta glucan is a type of fiber that can be found in wheat, rye, sorghum, barley, oats, shitake mushrooms, seaweed, and algae. Call Broad Ripple Tans at 317-257-8262 for high-quality affordable airbrush spray tanning in Indianapolis, Indiana. Our professional tanning salon is conveniently located right near Broad Ripple Village, and our tanning consultants are standing by to customize the perfect spray tanning course for you! Request a free estimate or information, today. This entry was posted in Tanning Facts and tagged Beta Carotene facts, Beta Carotene foods, Beta Carotene skin care, Beta Carotene tanning, Carotenoderma, spray tanning Indianapolis. Bookmark the permalink.